In HER IVF, a potential protocol for total cytoplasm replacement is to conduct sequential GVT and ST [19, 33, 37, 39, 41, 45]. First, a germinal vesicle from an oocyte containing high levels of pathogenic mtDNA is transferred to an enucleated, healthy donor oocyte (also at GV stage). The reconstructed GV is then allowed to undergo in vitro maturation (IVM) to reach the MII stage [78-83]. This can take up to two days of culture and is marked by the appearance of a polar body. Both nuclear and cytoplasmic maturity are required, however, for the successful progression of the MII oocyte to the blastocyst stage. When the MII stage is reached, and the birefringent spindle is visible, the cytoplasm is replaced again with a cytoplasm from a stage-matched in vivo MII (an oocyte which has not been in prolonged culture) . Conducting a second transfer after GVT ensures that the reconstructed MII has functional components to successfully complete the remaining preimplantation development [17, 18, 37, 44]. Most importantly, however, the second nuclear transfer ensures that any carryover, however small, from the first NT is diluted in the new donor cytoplasm. The well documented <2% carryover from ST ensures a close to zero chance of picking up pathogenic mtDNA persisting from the first nuclear transfer. 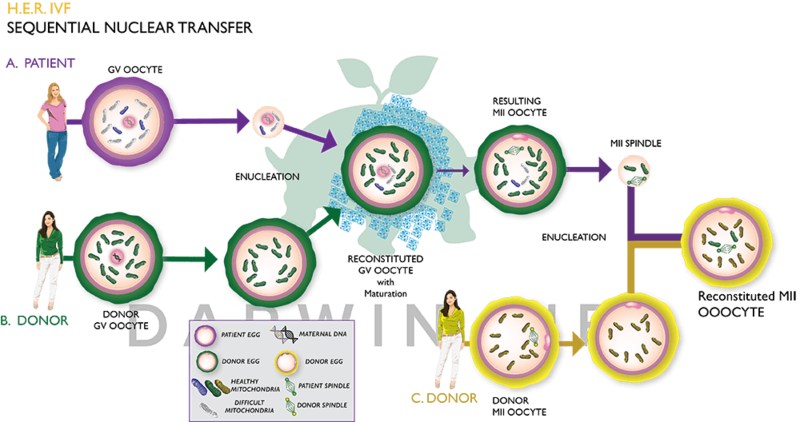 The total cytoplasm replacement is necessary to ensure that no carried over pathogenic mtDNA would have the opportunity to be selected for preferential replication and expand during development of the reconstituted embryo.